In ancient times, or so it feels, 90% and beyond was reserved for a chosen few who had been born under the correct alignment of the stars called Did-Nothing-But-Study-For-Months and Lady Luck. For today's generation, however, there's no cap on how much you can score. With marks sounding more and more like Torrent download speed, it is hardly surprising. Delhi University's first list cut off marks have known to hit 100% so let's all be a teeny bit glad that they've condescended enough to come down to 99.25% (thanks, Ramjas). The generosity is astounding. Over 2.5 lakh students have already applied for admission to the various colleges, which for obvious reasons, is amazing. These many students are eligible for these insane cut offs? This is probably giving past DU students an opportunity to appreciate their degrees that much more. 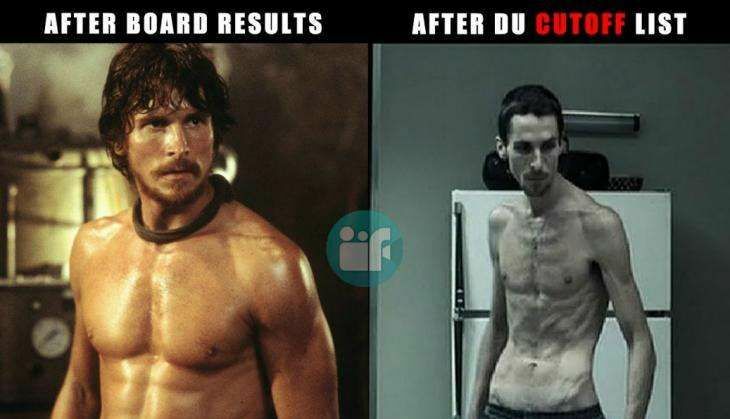 #DelhiUniversity cut off is measured by Vernier Scale. Pic 1: Mom after CBSE result. Me : Sir Ramjas ki cut off kitni h? Me : And couple entry k liye?